We face-lifted most of the rooms when we moved into the house. 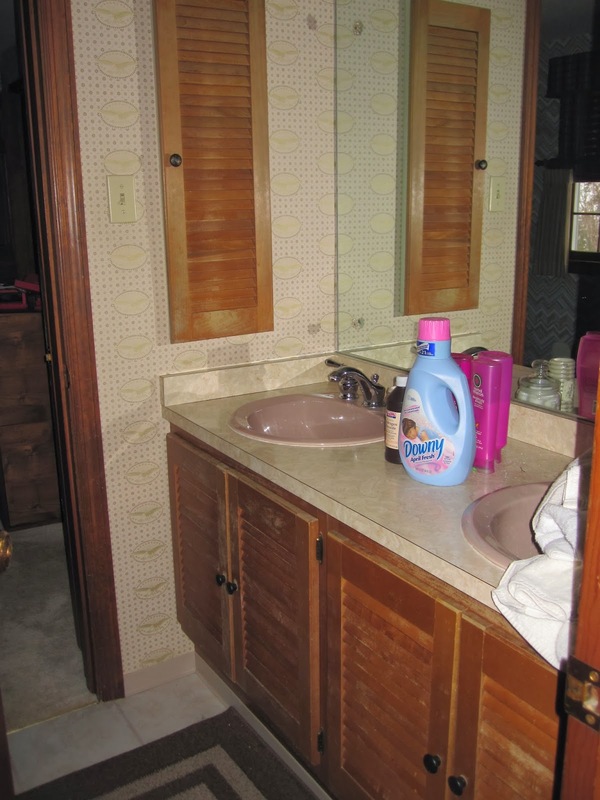 This bath had a lot of potential but just looked faded and unloved. 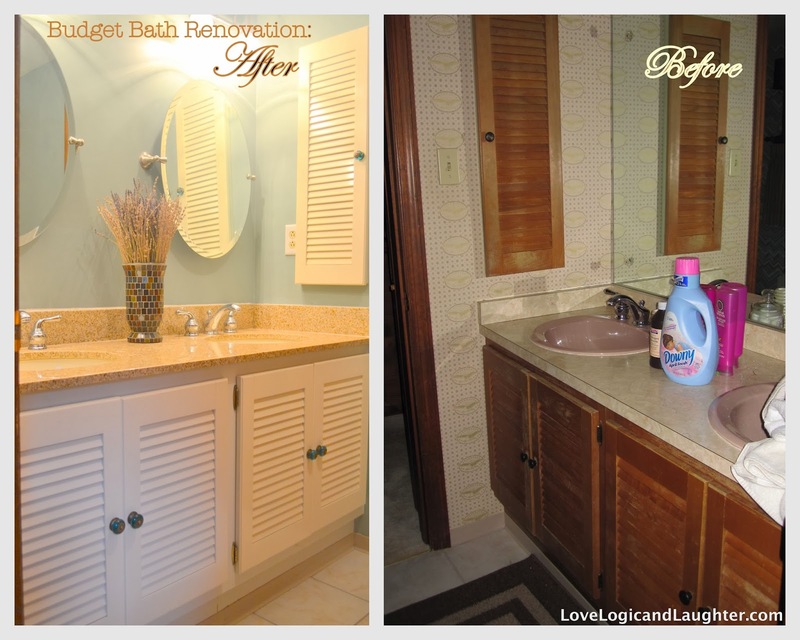 We were able to update the bath on a budget by simply applying some paint, a couple new mirrors, lights and countertop. Everything else we were able to re-use or re-purpose. We started by removing the wallpaper. This was task #1 for most rooms in the house. Once that was done we painted the walls and the cabinets. One benefit of the cabinets being in such poor cosmetic condition is that it didn't take a lot of sanding or prep work prior to being able to paint the first layer of primer. We used both spray primer and spray paint to paint the cabinets so that we could get an almost flawless "airbrushed" finish. Someday, I would love a paint sprayer (hint hint Jonathan ;-) By reusing the cabinetry already in the bathroom we saved several hundreds of dollars (maybe even a couple thousand dollars)- custom cabinetry is very expensive and because this is an older house we would of had to order a custom cabinet to fit this space. We removed these lights and the mirror and replaced them with new updated versions. 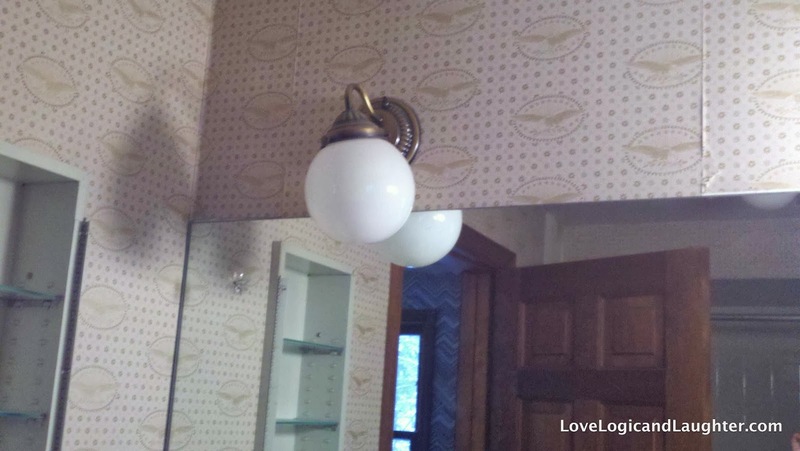 Two smaller mirrors were placed above each sink bowl with the lights centered above the mirrors. Because this room doesn't have a window (it is between two bedrooms - hence "jack and jill bath") it was pretty dark without any natural light. So when replacing the lights we purposefully looked for fixtures that would give off more light than what we previously took down. 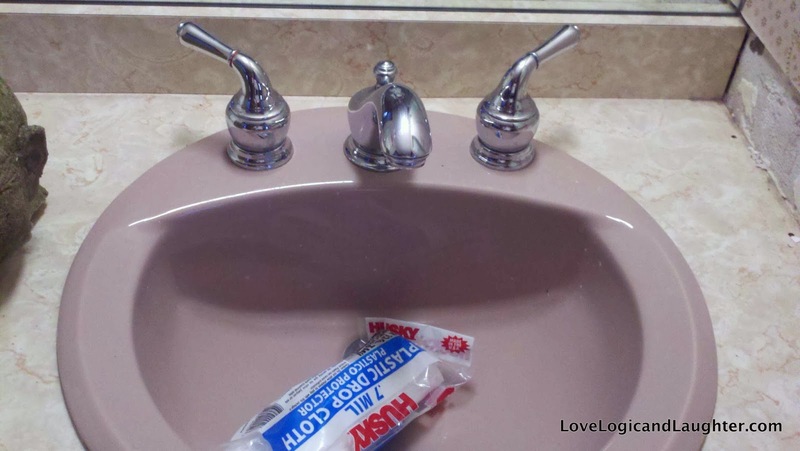 We replaced the sink bowls and and countertops, but we were able to re-use the faucets. We chose a granite that coordinated with the toilet and tub. They are a creamy color and this granite has a creamy undertone. I was nervous the day they were delivering the granite because I was afraid it may clash. I thought it might look like we were trying to match it and failed...but fortunately it looks better than I had dreamed the best case scenario could be. Being able to re-use the faucets saved us a couple hundred dollars! With a little deep cleaning they became bright shiny and almost new again! We also updated some of the hardware on the cabinets. I found these blue knobs at Anthropologie on clearance. I was happy with the way they semi-coordinated with the hinges that were already on the cabinet doors. This way we were able to re-use the hinges and just buy new knobs. We didn't do anything with the tub or toilet - we kept them as they were other than adding some artwork above the toilet and a new shower curtain for the tub. The artwork was a gift from my sister Nicola - I think she found it at a small boutique in Chicago. I love the playfulness they bring to this children's bathroom. The shower curtain was from Target. New tubs are very expensive. A lot of the expense can be in the labor, but the material is also pricey. We don't mind the color of the tub/toilet and with the new granite we think they almost look like we chose them to be this color when we redid the bathroom. There is one overhead light in the bathroom as well as a vent. We decided to keep them and re-purpose/update them by spray painting the base of the light and the cover of the vent. We ended up buying a new glass shell for the light (for just a couple dollars). The previous shell had been white. This one is clear and allows more light to shine through it giving us even more light in this no window bathroom. Light fixtures are easy to paint! You can update almost any fixture for about the price of one can of spray paint. To see more on spray painting light fixtures check out this post: Painted Light Fixtures/Chandeliers.